Do you run a medical practice and need an automated appointment reminder app? Medical, dental, and veterinary clinics use appointment reminders as a reliable tactic to reduce no-shows. Why Do I Need an Appointment Reminder App? When your daily schedule runs according to plan, your practice ultimately conserves valuable staff time and sustains a steady flow of patients and income. But your patient communication efforts are only as effective as the tools you use to relay and confirm each message. By using an automated appointment reminder system, your appointment no-shows will reduce, and your patient retention will increase. There’s a reason thousands of clinics across the country are using this method. Because it works! How Does the Appointment Reminder App Work? DoctorConnect’s Appointment Reminder solution syncs with our Appointment Scheduling System, or your currently existing scheduling platform. Once your patient appointments are synced, your patients will receive a email, phone, or text reminder to confirm their appointment. Patients will be able to respond to appointment reminders to either confirm or reschedule their appointment. It’s as simple as that! 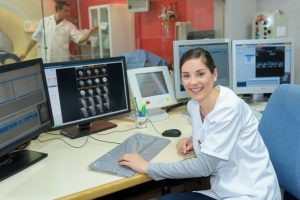 Your office staff will be able to focus their efforts on more day-to-day operations instead of constantly following up with patients. Unlike industry competitors, DoctorConnect channels an interactive, two-way communication system that sends reminders and logs patient responses. 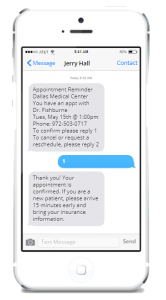 Our medical appointment reminders communicate via automated text message, voice message, and/or email — pick and choose one or multiple formats based on each patient’s indicated preference. No matter which reminder method a patient receives first, they can immediately confirm or request a reschedule in real-time. Select your desired reminder intervals and times, from 1 week to 1 hour before a scheduled appointment. Send reminders on an individual basis or set up custom group notifications. Voice reminders are text-to-speech, so you can change them on the fly without recording new audio. No duplicate entry needed! DoctorConnect imports all contacts and appointments and integrates with almost every major scheduling system. It can even be used as a stand-alone tool. Please see our FAQ page for a sample list of software integrations. Our medical appointment reminders are able to push confirm data back into your EMR/PMS. DoctorConnect’s automated appointment reminders are ideal for any size or type of medical office. When you are a part of the DoctorConnect system, your team will have access to DoctorConnect customer service representatives for thorough assistance on-demand. Rely on DoctorConnect medical appointment reminders to improve your practice’s workflow and revenue!